August 28, 2014  NPR TV critic Eric Deggans ranks Amazon's new batch of five series pilots, asking why none of them seem to break the rules of TV quite enough to draw attention. August 28, 2014  When the Colombian actress appeared in a widely derided stunt at the Emmys, much of the attendant outrage centered on her very prominent image. Juan Vidal argues this lets Hollywood off the hook. August 28, 2014  Hamm has never won an Emmy despite 13 nominations, including two this year for Mad Men. In 2010, Hamm talked with Fresh Air about how Draper was "losing touch" with his life and the world around him. August 28, 2014  Falco plays ER nurse Jackie Peyton, who is competent at her high-stress job but struggles with addiction. Falco was nominated for an Emmy for her role on Nurse Jackie, which is in its sixth season. August 28, 2014  During an armed robbery at a Wendy's restaurant in Omaha, Neb., the audio supervisor for the TV show was struck by "friendly fire" from one of the officers. The robbery suspect was also killed. August 27, 2014  Lifetime's new makeover show layers racial politics on top of the uncomfortable dynamics of manipulating beauty and style choices, and comes up with something to offend just about everyone. August 27, 2014  C.K. won an Emmy for outstanding writing in a comedy series for an episode on his FX show Louie. In 2011, C.K. told Fresh Air about making his comedy special and his relationship with other comedians. August 27, 2014  Paul won the Emmy for outstanding supporting actor in a drama series for playing student-turned-drug dealer Jesse Pinkman. In 2011, he said his character was supposed to die in the first season. August 27, 2014  Glen Weldon and Linda Holmes take a few minutes to check in on the state of the Bravo-to-Lifetime reality show that dares to ask: Is it shiny enough for Heidi? 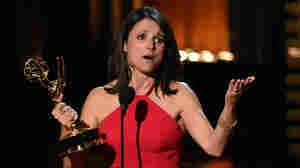 August 26, 2014  NPR TV critic Eric Deggans says Monday's Emmy Awards promised to recognize TV's emerging future — but ultimately rewarded comfortable favorites over disruptive upstarts. August 26, 2014  Plenty of statuettes were handed out Monday night at the Emmy Awards in Los Angeles. ABC's Modern Family won for best comedy series and AMC's Breaking Bad won best drama series. August 25, 2014  Nearly a year after wrapping up, the AMC drama Breaking Bad and its star Bryan Cranston have two more nice going-away presents: Emmys for best drama and actor in a drama. August 25, 2014  The Emmy Awards are always good to past winners, but Monday's round of victories were about as conservative as it gets. Surprising, given the warm sendoff to a show about a drug dealer. August 25, 2014  The list of winners at Monday's 66th annual Primetime Emmy Awards presented by the Academy of Television Arts & Sciences.